A&E has released a new poster (see above) and teaser (watch below) for the fourth season of its Bates Motel TV series. Bates Motel, season four, premieres Monday, March 7, 2016 at 9:oopm ET/PT, on A&E. A modern-day prequel to Psycho, Bates Motel stars Vera Farmiga as Norma Bates. 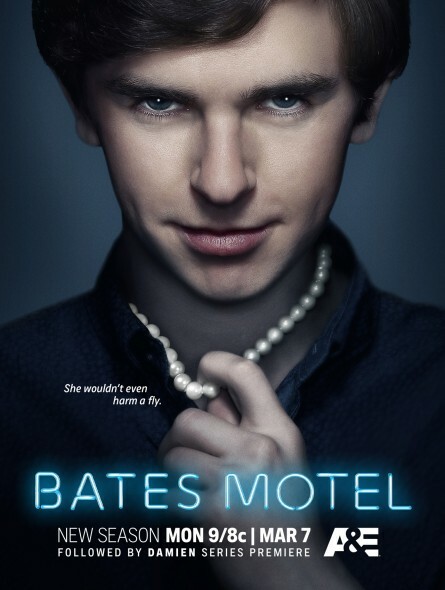 Freddie Highmore stars as Norman Bates. Lost‘s Nestor Carbonell is Sheriff Romero. A&E Network presents the season four return of the critically acclaimed drama, “Bates Motel,” starring Vera Farmiga in her Emmy nominated role as “Norma Bates” alongside the brilliant Freddie Highmore as “Norman.” From writers and executive producers Kerry Ehrin (“Friday Night Lights,” “Parenthood”) and Carlton Cuse (“Lost,” “The Strain”), this season will showcase Norman’s deranged descent into madness. The series will premiere on Monday, March 7th at 9PM ET/PT on A&E. Immediately following the fourth season premiere of Bates Motel, on A&E, is the series premiere of Damien. A sequel to The Omen film, Damien features a grown up Damien Thorn (Bradley James). Check it out, here. Are you a fan of the Bates Motel TV show? Do you plan to tune in for the fourth season on A&E? Will you stay tuned for the series premiere of Damien? Tell us. More about: Bates Motel, Bates Motel: canceled or renewed?, Damien, Damien: canceled or renewed? I will definitely be tuning in to the Bates premiere! Ive been googling ”Whens the Bates Motel season 4 premiere? ?” since late Summer! This show is such a treat to me, Im looking forward to seeing Norma again shes a fascinating character. I hope to see more of ‘Dillon’, the handsome brother, hopefully he sticks around. So yes… cant get enough! & Im not sure about the Damien premiere, I’ll have to see the trailor and all. For me, I can tell by the lighting and chemistry of characters if I’d enjoy a show or not. I have a feeling this season is a major turning point in the character development of dear Norman, Can’t wait to see this transformation complete itself in the long run! Hats off to Freddie & Vera for a job well done! GREAT SHOW, one of the all time best! Can’t wait. Great cast and writing!